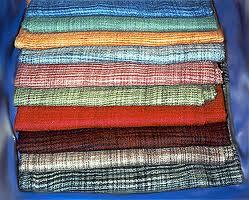 We like to introduce ourselves as manufacturer and exporter of Hand Spin & Hand-woven Khadi Fabric. Our company was established in the year 1980. Our Aim & Objective: To provide job to the poor Silk & Muslin spinners & Weavers & for uplifting them from poverty. We are having 28 regular Staff members, 136 silk artisans, 186 muslin artisans.